That’s the difference between the high temperature on December 26 and the high on December 31. I’m still not entirely convinced about global warming, but there have been a lot of strange things going on with the weather in recent years. We did have local warming in a big way last week, with a high of 55°F on December 31. That is pretty unnatural for the Chicago area. Just a few days earlier on the day after Christmas, the high for the day was 31°F and a few inches of snow had fallen overnight. The dogs loved it because it was deep enough to wrestle in and roll around in. Please note that these are Rottweilers at play, not war. They may appear to be killing each other, but trust me. They tell me this is big Rottweiler fun. Temperatures were warm enough on the 29th and 30th for the snow to start melting. The unseasonably warm temperatures on the 31st killed it off almost completely. I don’t have photos of the in-between swamplike stage featuring freezing cold mud, but here’s that same yard on New Year’s Eve day, after rain overnight and through the early morning. We’re back to a more typical 20something°F today. No more local warming here. Yeah, truly, isn’t it? We have it up and down too, just yesterday was plus 8 celsius in the middle of night! This up and down weather doesn’t do anything for the way Jasmine feels. Sending love to Jasmine from all of us at Haus Viersen. These temperature fluctuations can almost guarantee that one of the humans here will catch a nasty winter cold. 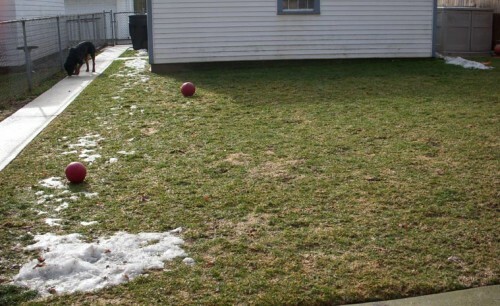 We’ve lost all our snow, too. Depressing. I’m not too depressed about the snow loss, but the dogs probably are. I love having “conversations” with the “talking” Rottweilers. 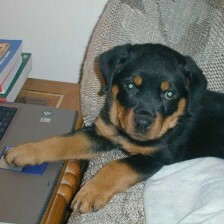 It’s only scary to people who don’t speak Rottweiler!